We want to support you and your events, so from now on we sponsor several premium packages for small and charity events every month. So if your event falls into this category then contact us and we’ll support you with a premium event app. How this works, we will now clarify together. We sponsor premium packages for your events! The exact description of this package can be found on our homepage under Pricing and “Feature Comparison”. All events that fulfill the requirements will receive a coupon code at the end of each month that allows them to upgrade their app to Premium for free. With this campaign, we want to promote the small and voluntary events who don’t have a corresponding marketing budget. Accordingly, only such events are supported. Commercial events are excluded from this sponsorship. For all other events and organizers, we offer a comprehensive test phase and start discounts. Just talk to us if you could see yourself in this category. The application is straightforward. 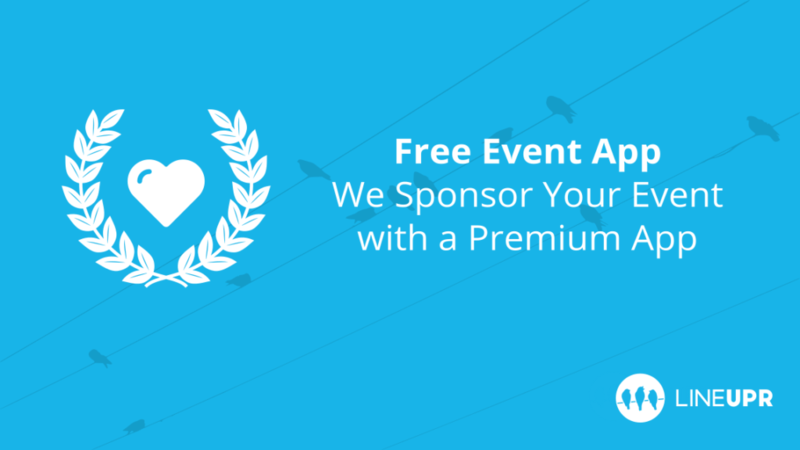 First, write an email with the subject “Event App Sponsoring” to Eric@lineupr.com. 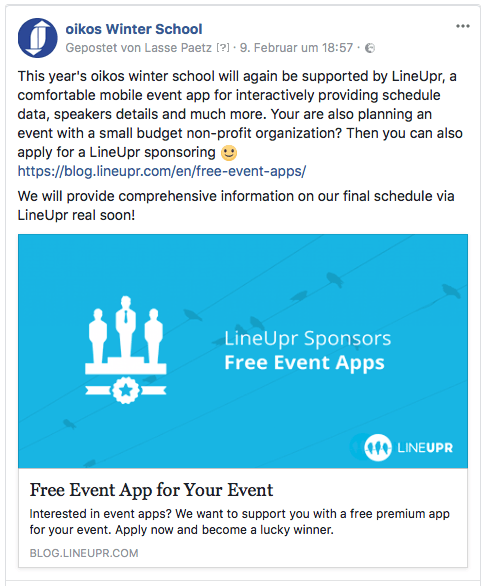 In this email, you should describe your event in 2-5 sentences and why you want to use an event app from LineUpr. We will then confirm if you meet the requirements and if we can support you with a premium app. Use the hashtag #freeeventapp. Whether you share the post on Facebook or Twitter is your decision (both are allowed 😊). This post/tweet must remain at least until your event, otherwise the application is invalid. If you’ve published the post, please take a screenshot of it and send it to Eric@lineupr.com. We will then email you the coupon code that allows you to upgrade your app to Premium for free. The legal process is excluded. LineUpr reserves the right to change or terminate this promotion at any time. “Laurel Wreath” Icon createt by Charlotte Vogel from “the Noun Project“. Previous PostPrevious The end of native event-apps like we know them?